Seattle Weekly is one of the Puget Sound area’s main news sources, offering “deeply reported stories, stirring critiques, and insightful interviews.” Through both print and digital editions Seattle Weekly connects its readers to the doers, thinkers, businesses, and entertainers that shape this city and give it life. In six weeks update and redesign Seattle Weekly’s online homepage and secondary pages, including a new strategy for advertising. We wanted to make the Seattle Weekly more appealing to its user base with simplified navigation and streamlined site architecture, the redesign makes for an enjoyable site for finding the content its users desire most. The updated site was designed to be responsive for mobile, tablet, and desktop. It was important to refresh Seattle Weekly’s website branding to better visually pair with the content of their print paper. The updated business model uses social media, community-sponsored content, and native advertisements. Our research found that Seattle Weekly serves Metro Seattle, Tacoma, Everett, including the eastside suburbs of Bellevue, Redmond, and Kirkland. Each month the digital version receives 633,146 unique visitors. The site gets and average of 1,704, 016 page views monthly with an average of 2.59 pages per visit. The male to female online readership ratio is 1.44:1 with the single to married online readership ratio at 1.41:1. Approximately 85% of readers have some college degree or beyond, and approximately 90% of readers households make 50K or more. Our website audit identified several design flaws and challenges for users. There was a lack of clear hierarchy along with overly complicated and repetitive navigation. The site did not have strong branding, thus creating inconsistent styles and competition between flat and skeuomorphic design elements. Few elements mirrored the hierarchy and design of their print edition. 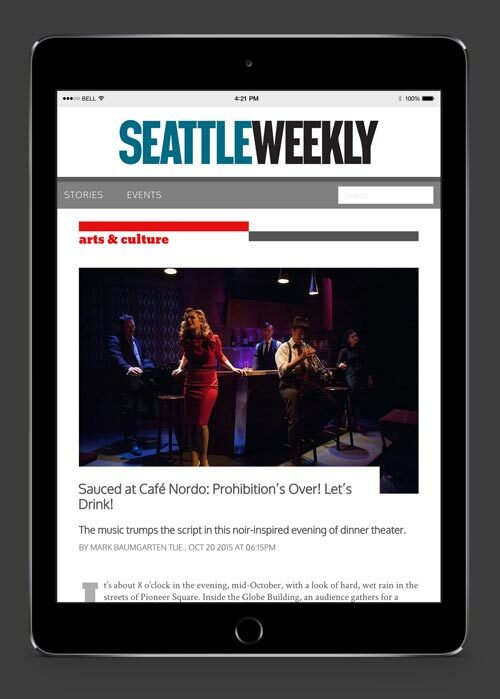 Advertising on the Seattle Weekly website lacked cohesion, allowing for corporate dominance on the page instead and lead to a great deal of user distraction. Our personas helped to inform our decisions for visual hierarchy and communication, so we developed two that let us speak to different areas of user needs. 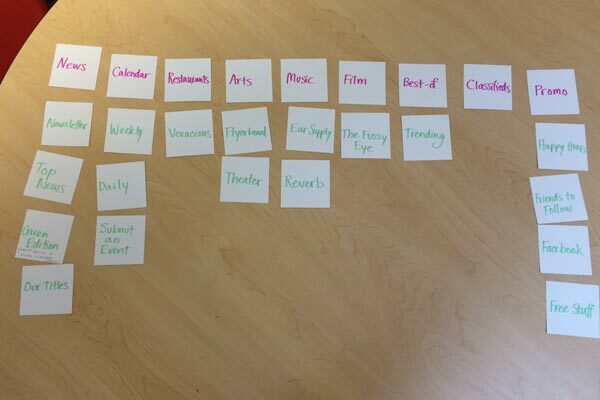 As our research progressed we identified a task that our personas may have in common: searching for and choosing activities of interest in the greater Seattle area. Chris recently started online dating. He has a date scheduled for next Thursday night with Therese and wants to make a good impression. He is checking SW online to find an event they could attend in Fremont, preferably within walking distance of where he is planning to take her for dinner. 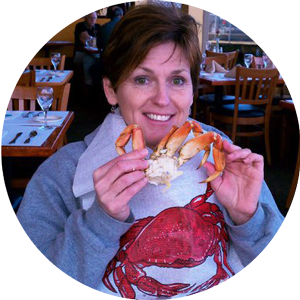 Mary and her husband are in Seattle for just a week while they are on their PNW vacation. While in town they are hoping to catch some local attractions, visit the SAM, and hopefully see some live music. They are staying at an Airbnb in Fremont and the host suggested they find nearby live music by checking the Seattle Weekly’s event calendar on the website. 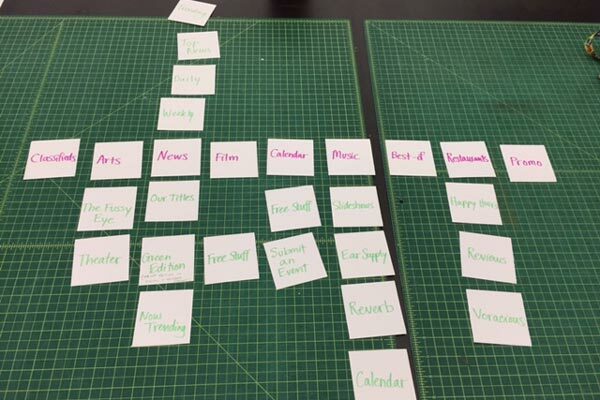 Card sorting helped us to gain a greater understanding of the overlaps in language and the lack of clarity on Seattle Weekly's website. Then we worked with a large group of users, observing and recording their attempts to perform our primary task on the current site. A majority of our testers were unable to complete the assigned task due to the complexity of the existing site’s layout and navigation. One observation worthy of note was that nearly every tester started their task in the browser by searching for Seattle Weekly activities via google.com, and then directly selecting a secondary page of listed events. 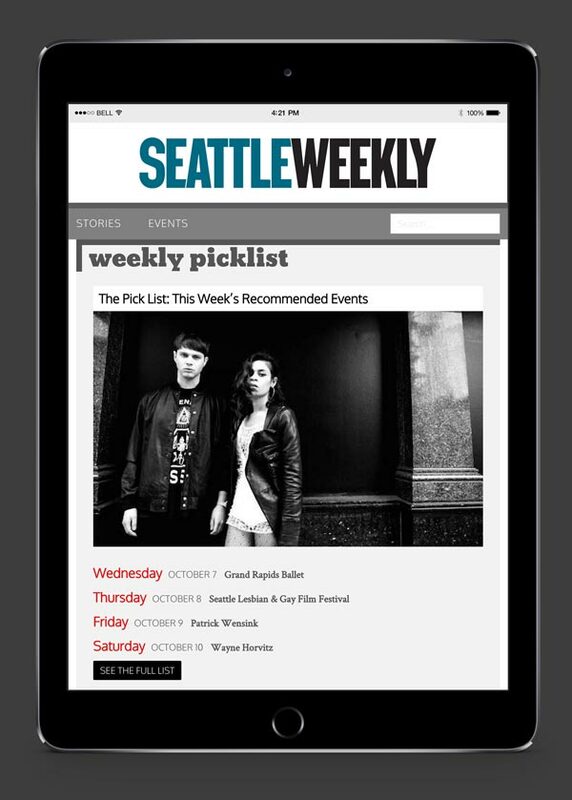 This informed us that some users may not even begin their experience of Seattle Weekly through its homepage. Thus, we made sure that clear navigation and site content were accessible to users regardless of what page of the website they visited. This text describes the image (if needed). 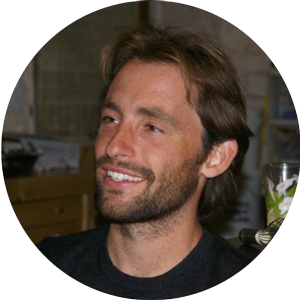 There was a moment in the review of all of our research where the simplicity of it dawned on us. 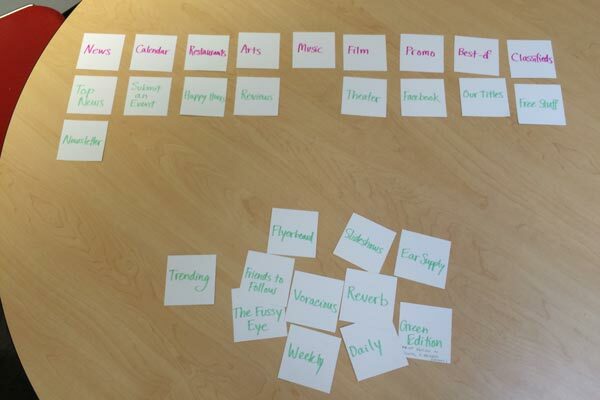 Everything that a user can access through the main navigation of the Seattle Weekly fell into one of two categories — journalism or local activities. 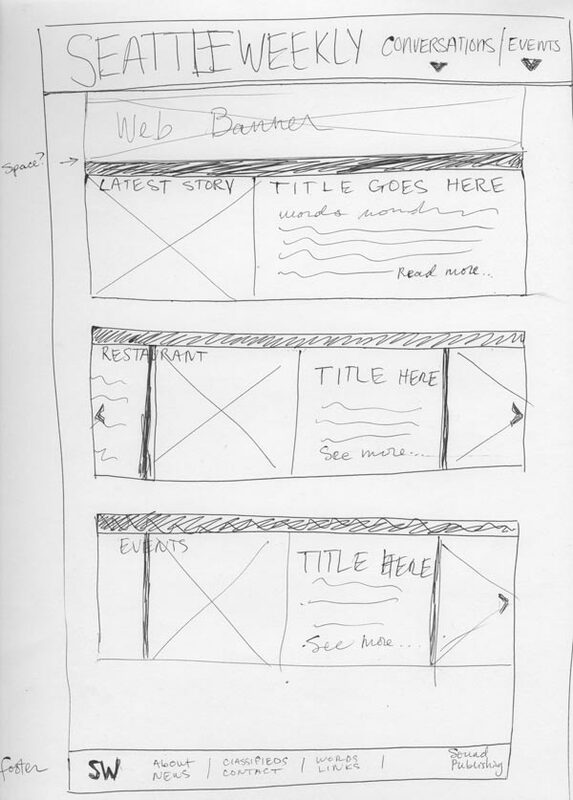 Our two-fold navigation followed, allowing users the simplicity of deciding between stories or events. 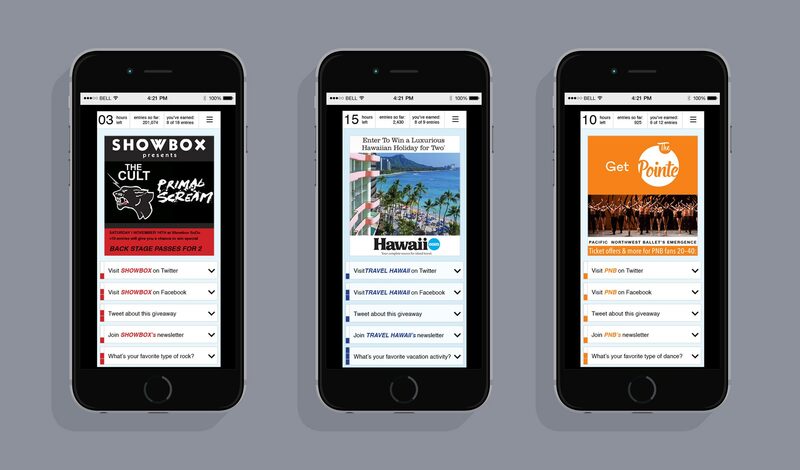 Shortly after creating our redesign of the Seattle Weekly we were surprised and proud to see how our navigation concept wasn’t far off the mark - The Stranger launched a redesign of their website using a very similar two-fold navigation (Things to Read and Things to Do). 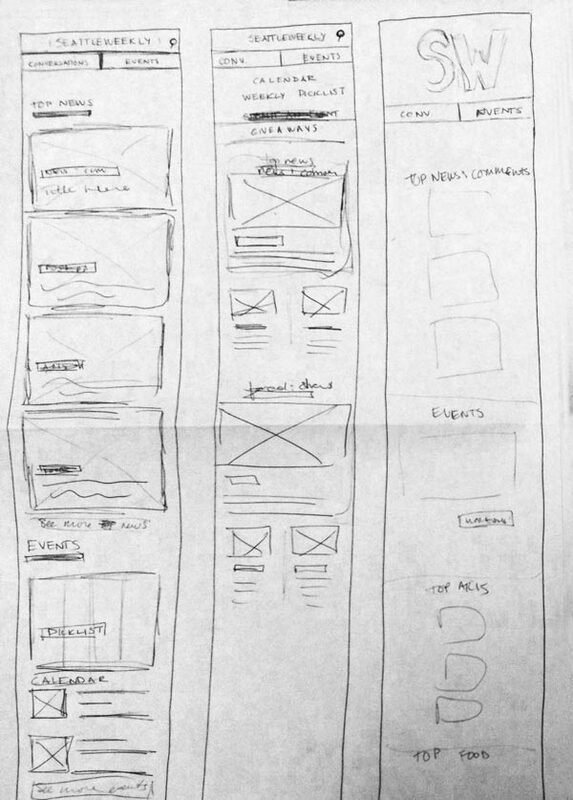 Based on user interviews, our site map, and relevant data we began wireframing the site using a mobile-first approach. 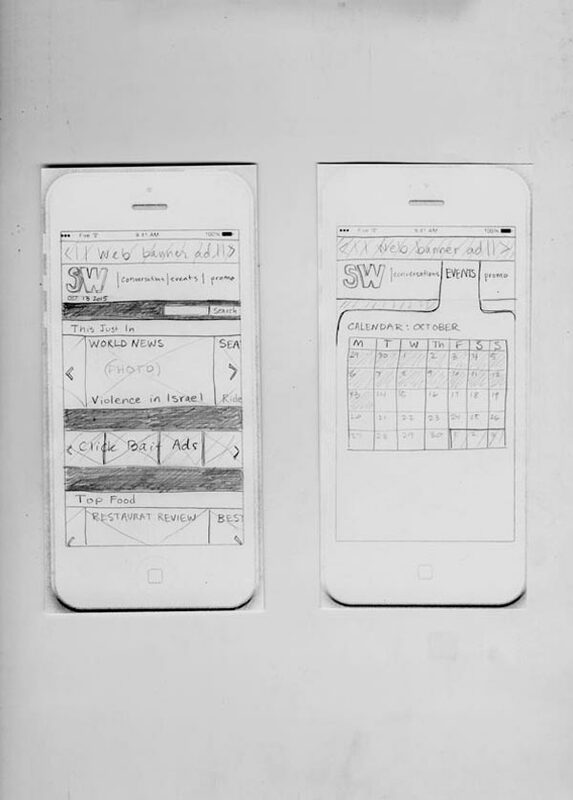 Early paper prototypes allowed us to walk through tasks and understand valuable UI movement. User testing of our prototypes further informed design and our visual hierarchy. Consistency in the brand identity was at the forefront of our style tile rules. We wanted to include elements of the print edition’s design to help communicate similarly in digital format. We sourced web-friendly fonts that closely matched the print edition’s style in order to keep consistency throughout. We also updated the site to have a responsive logo that was in better keeping with their brand. From a UX perspective the website redesign needs to offer a pleasurable reading experience free from as many distractions as possible. Yet it also needs to incorporate digital advertising in a valuable way for businesses to want to work with the Seattle Weekly digitally. Our business strategy incorporates sponsored articles, social media sharing, and giveaways into the site’s content. We looked at the importance of social media shares in gaining viewership and weighed its cost to readers. Our research found that Seattle Weekly’s younger base of online readers see value in sharing content that gives them something in return. Referencing marketing giveaway applications, we proposed offering native advertising through Rafflecopter, where users could tweet or share advertiser content for the chance to win tickets or experiences related to the ads. We used our updated branding to help guide the styling of these native ads to more cohesively match the website. 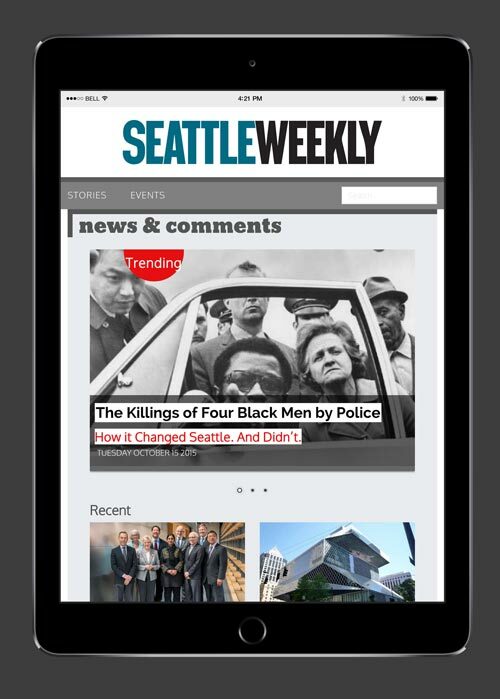 Our goal was to provide Seattle Weekly online readers a place for engaging stories and current events. 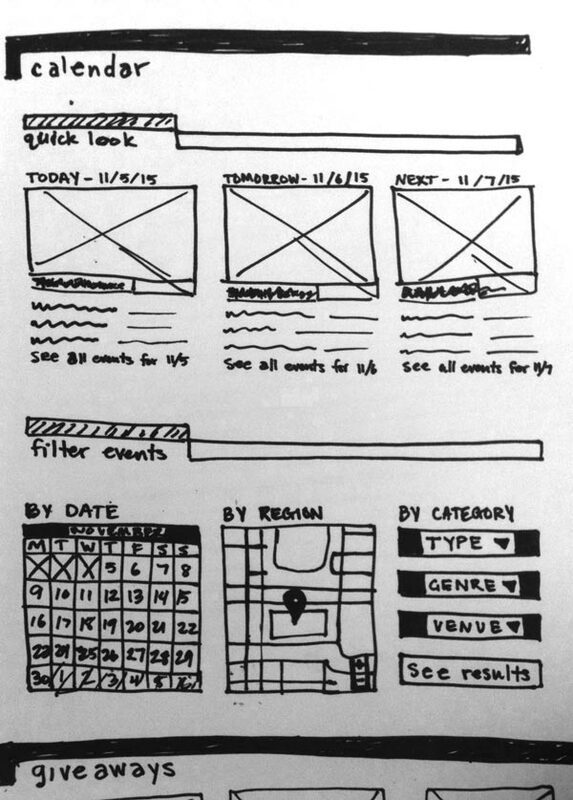 We wanted the experience to be on-brand, memorable, and free of any hiccups in navigation. The live site is temporarily unavailable, but will be back up shortly.